Heat oven to 350°F (325°F for dark or nonstick pans). Place paper baking cup in each of 12 regular-size muffin cups. In medium bowl, mix flour, baking soda, salt and baking powder; set aside. In small bowl, mix boiling water and cocoa until dissolved. In large bowl, beat 1/2 cup softened butter with electric mixer on medium speed 30 seconds. Gradually add granulated sugar, beating well. Beat 2 more minutes. Beat in vanilla and egg until blended. On low speed, alternately add flour mixture and cocoa mixture, beating just until blended. Divide batter among muffin cups. Bake 20 to 25 minutes or until toothpick inserted in center comes out clean. Cool 5 minutes. Remove from pan to cooling racks. Cool completely, about 30 minutes. In large bowl, mix powdered sugar and 1/3 cup softened butter with electric mixer on low speed until blended. Stir in vanilla and enough milk until smooth and spreadable. Frost cupcakes, and decorate as desired. Bunny Cupcake: To make ears, cut each large marshmallow crosswise into 5 pieces with kitchen scissors. Press 1 side of cut edges into pink sugar. Use mini candy-coated chocolate candy for eyes and regular size for nose; use chocolate sprinkles for whiskers. Carrot Cupcake: Crush chocolate sandwich cookies for "dirt" on cupcake. Use orange candy-coated chocolate candies to make carrot. Cut green bite-size chewy sour candies in half lengthwise, then partially cut into thin strips, not cutting all the way through for carrot top. 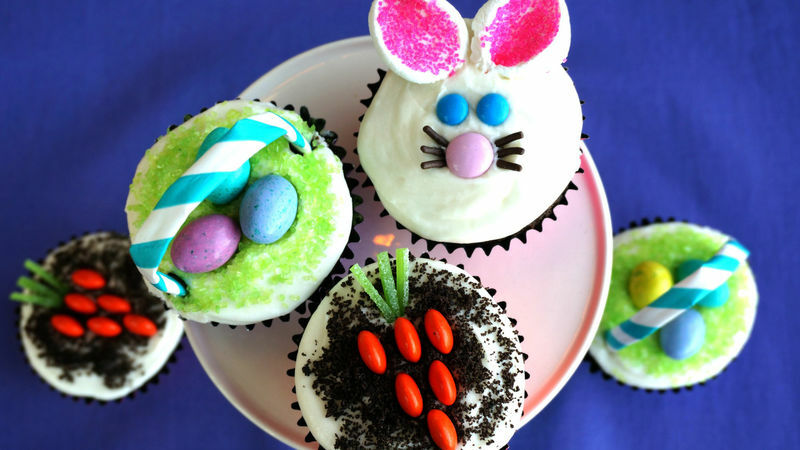 Easter Basket Cupcake: Cut paper straw 7 inches long for handle; sprinkle cupcake with colored sugar, and top with Easter candy eggs.